For years, Clarksburg’s Sheila Rice took stray cats into her home: male and female, young and old, long- and short-haired, gray, black, white, orange tabby and calico. Though some who know her well consider her a typical “cat woman,” Rice has other interests, too, including her longtime career with CENTRA West Virginia Transit Authority. She kept up with her work - and her fleet of felines - despite the fact that she lived with cerebral palsy. At any given time, she has had a dozen or more felines at her residence; all fed and cared for and loved. But in recent months, Rice has also battled kidney disease, enduring a never-ending cycle of care involving hospital stays, periods of rehabilitation and back home. She is now in a stage 3 kidney failure situation with dialysis in her near future. Her physicians recommend 24-7 care in a personal care facility, but because of her love and compassion for her cats, she won’t relocate until she knows the cats are safe and cared for. A family friend has reached out to Connect-Bridgeport, asking individuals and families who may want to adopt a cat to consider taking one of those pictured below. 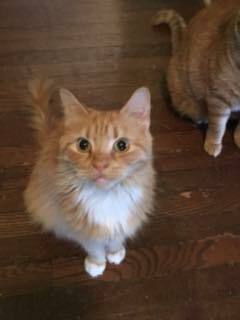 There are presently seven cats in need of a home. They’ve been rescued once and had a loving home. 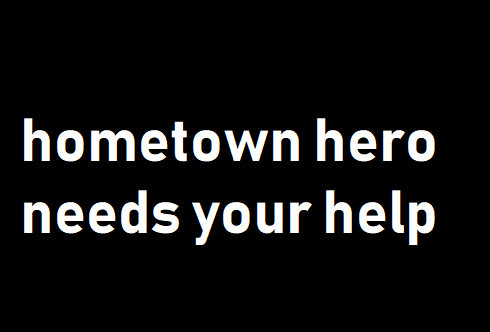 Now they’re in need of a second rescue. Those who welcome one of these felines into their homes and families are not only helping the cat, but this woman, too. The family friend who reached out is Donna Elliott, formerly of Bridgeport and now living in North Carolina, where she serves as marketing director for a law firm. She, too, is active in pet rescue and wellbeing. She said the Humane Society of Harrison County was made aware of the situation, but that they cannot – understandably – take several cats into the small facility. The Humane Society is a no-kill shelter and does a phenomenal job of placing cats and dogs, but it has limited space and resources, not to mention that, generally, cats are more difficult to find homes for than dogs. Rice was given the option to take the cats to Harrison County Animal Control, but she can't live with not knowing if they find a home. 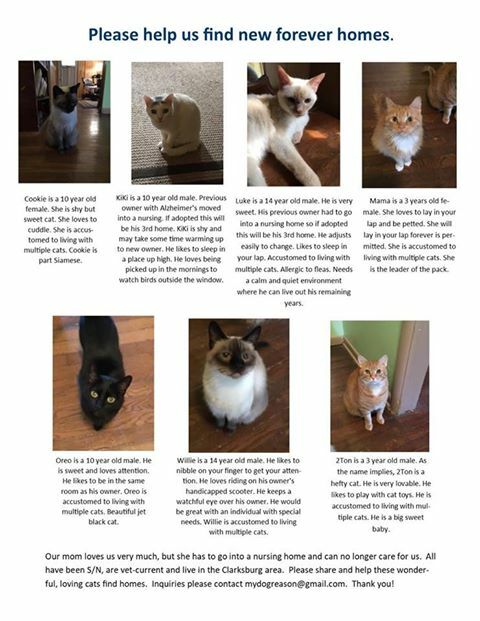 If you or someone you know are interested in adopting one of the cats pictured, contact Donna at onna at 919-621-1921 or email mydogreason@gmail.com. All cats been spayed or neutured and are vet current. Prospective adopters will be screened, but there will be no adoption fee.